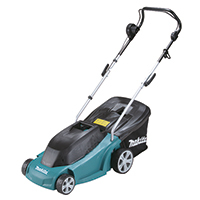 More maneuverable electric lawn mower. - Cutting height can be adjusted at 3 stages. - Carry handle makes easy to handle. - Lever type knob is easy to operate. 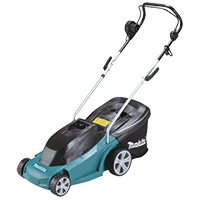 More maneuverable petrol lawn mower. - Cutting height can be adjusted at 5 stages by one handle. - Large knob is easy to grip. - Rubber tire for good gripping lawn. - Plastic front cover protects the steel deck. 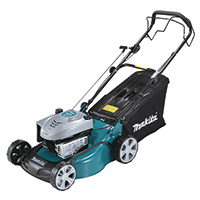 More maneuverable petrol lawn mower with self-propelling function.